Short Information: Railway Recruitment Board is conducting examinations to recruit the candidates in RRB ALP category. Many lakhs of aspirants have applied for RRB ALP vacancies. The scheduled first stage CBT for RRB ALP was conducted on August 31, 2018. The Railway Recruitment Board will take around 1 to 2 months to evaluate the answer papers and release the alp result 2018. So, the RRB ALP/Technician Result 2018 expected date for the first stage CBT is October 2018. You will be notified on your mobile number or e-mail id when the RRB ALP result 2018 is declared. You can check your RRB ALP/Technician Result 2018 CBT by entering your User Id and Date of Birth.The Railway Recruitment Board also conducted re-examination for those candidates who were affected by floods in Kerala on September 4. For more detailed info regarding to RRB ALP/Technician Recruitment 2018 kindly visit official website and read carefully employment advertisement before applying against to RRB ALP/Technician Vacancy Online Form. 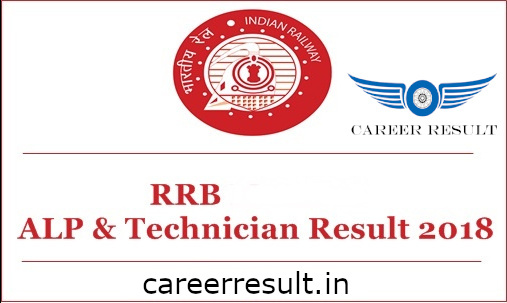 Subscribe Careerresult to get latest updates about RRB ALP/Technician Result 2018 on your smartphone via E-mail. For more latest jobs updates in Railway Jobs Stay connected with us.All candidates have to request is to share this job link with your friends over at Whats App, Facebook ,Twitter,Instagram and help them get good career in your life.